I have been quite surprised by the amount of emails that have come to me through this website,and quite a few of them have been regarding rigs and tactics for fishing this area.I shall therefore pass on a few rigs and ideas that I use myself on this page,just to give anyone comparitively new to sea fishing,how to vary their tackle for various conditions. This rig is designed for use when you are fishing at a distance over reefs and kelp.Sometimes when you hook into a fish,you can lose it because your sinker is hanging below the fish on the retrieve,and catches on reefs or kelp,snagging you up,and making you lose your fish,(especially if you're using a grip-lead).This rig makes sure that your sinker is hoisted up above the fish on the retrieve. It's a very simple and cheap rig to make which is helpful given that by definition the ground will be rough where you use it.All you have to do is to take a piece of line around 4 feet long,tie your weight to one end,pass it through a swivel,through a bead,through a crimp,and tie on your hook. 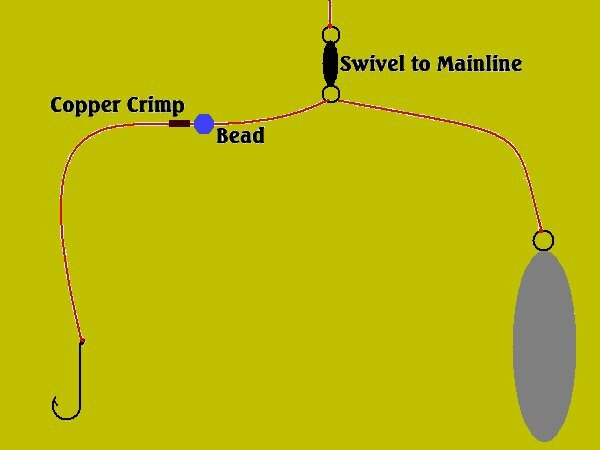 Squeeze up your crimp at your desired hooklength,(about 20 inches or so from the hook),and that's it. 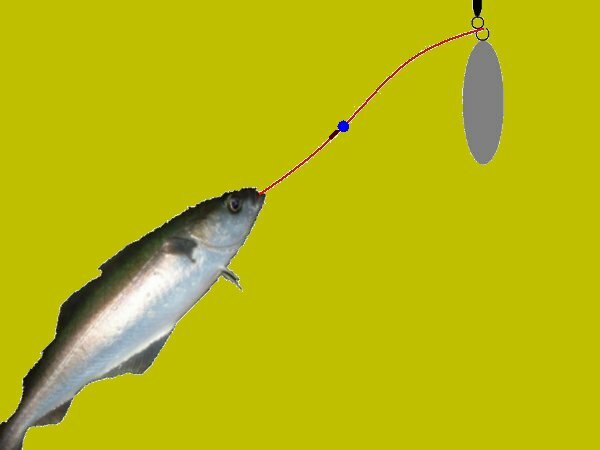 If you now hold up the rig by the swivel,your bead should lock against the swivel eye,and give you the presented rig.When a fish takes the hook,and you begin winding in,the weight of the fish causes the sinker to pull through the swivel eye unti it locks up.This makes sure that your sinker is nicely out of the way of any snags as you're retrieving your fish. 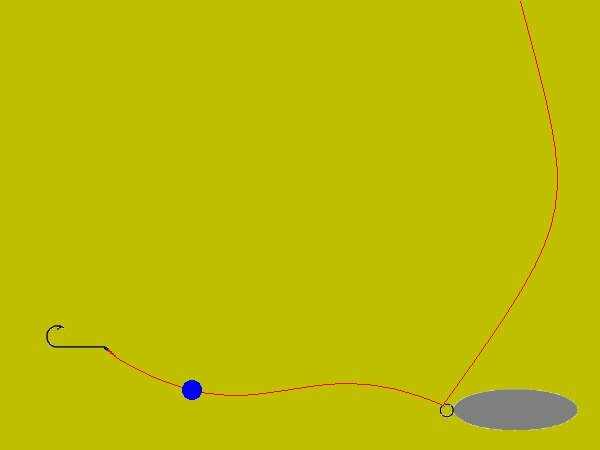 The point of a wishbone rig is simply to present two baits in close proximity to each other.I find this works very well when float fishing at low water rock marks.It's reasonably easy to tie,just follow this next bit. Take a piece of line around 30 inches long,and tie on one hook in whatever size you fancy. ( 3/0 is good for this area).Slip a copper stop down the line to about 2 inches above this hook and squeeze.Feed on a bead.Feed a piece of silicone tubing around 6 inches long down to the bead,then another bead.Next slip on a swivel,then another bead,then another piece of tubing the same size as the first.Next another bead,then another copper stop.Push all your comonents up tight,and then crimp your copper stop.You need this tension on the rig to splay the baits apart.Lastly,tie on your second hook and cut off the tabs. Really good for float rigs which should be fished just over the kelp for best effect.Use a big enough weight to sink your float,and adjust until the float,although sunk,is just under the surface.Pull up and make your float rig 4 feet shorter than this to allow for the height of the kelp. This is a really interesting 'fun' rig to use when the species you are after is inclined to take a moving bait,and also to make a run when it's picked the bait up.I think it's quite popular in Ireland for sea trout where they use a sandeel as bait with a plain hook through it's jaw,and a treble hook through the back. 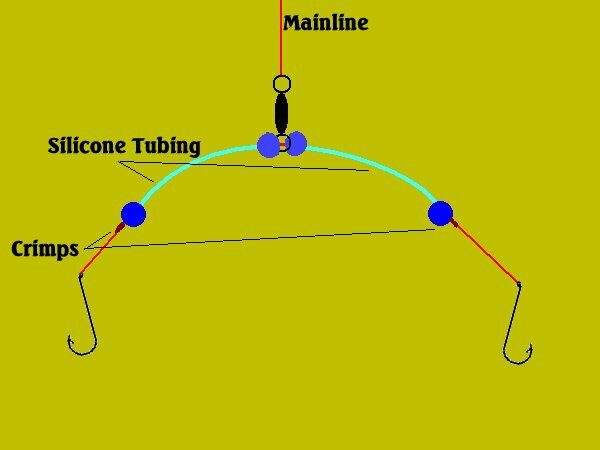 This rig has to be the simplest rig in the world to tie.Simply pass your mainline through the eye of your sinker,through a bead,and then tie on your hook.The idea is that when you cast out,the sinker lies on the bottom,but the bait can take line through the sinker and drift away with the movement of the water,creating a moving bait.I used this rig in an attempt to catch a sea trout,but managed to catch 3 or 4 coleys which just showed at least that the principle is sound.When allied to a baitrunner reel the effect is great.